Britain's Amir Khan has missed out on a fight against Manny Pacquiao, with the Philippine great choosing a third match with American Timothy Bradley instead. Pacquiao, 37, has not fought since he was convincingly beaten on points by Floyd Mayweather in May. Promoter Bob Arum says Pacquiao and WBO welterweight champion Bradley, 32, will meet in Las Vegas on 9 April. Khan also hoped to fight Mayweather in 2015 but the American great retired after beating Andre Berto in September. Khan, 29, only fought once in 2015, outpointing Chris Algieri in May, and looks set for a clash with Sheffield's IBF welterweight champion Kell Brook in the summer. "He has a spotty record, hasn't done great ratings, Arum told the Los Angeles Times. "Why would we feel he'd do well on pay-per-view?" Bradley was awarded a controversial decision against Pacquiao in 2012 before the six-weight world champion earned revenge in 2014. Arum claims he has agreed deals with both fighters, though the paperwork for the bout has yet to be finalised. 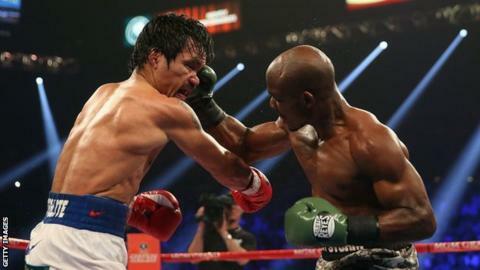 The Bradley fight could be Pacquiao's last, although Arum refused to confirm that would be the case.